MILWAUKEE (AP) The game was already well in hand for the Milwaukee Bucks, but a thunderous dunk by Giannis Antetokounmpo in the final minute provided an exclamation point on a successful stretch of three home games in four days. Antetokounmpo scored 24 points in the second half, drawing chants of ”MVP! MVP!” from the home crowd on multiple occasions. Khris Middleton and Eric Bledsoe each added 20 points. 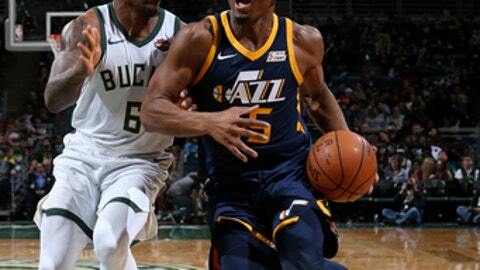 Jazz: Guard Rodney Hood missed his seventh straight game with left ankle soreness. … Guard Raul Neto left the game in the first quarter with concussion-like symptoms and did not return. Bucks: Guard Tony Snell sat out for the second consecutive night with left patella tendinitis. … Listed as questionable prior to the game, guard Matthew Dellavedova remained out with left knee tendinitis. … Guard Gary Payton II made his second straight start in place of Snell and played a season-high 23 minutes. The trio of Antetokounmpo, Middleton and Bledsoe combined to score 227 points during Milwaukee’s three-game winning streak. The Bucks are 11-4 since acquiring Bledsoe from Phoenix on Nov. 7. After hitting a franchise-record 18 shots from beyond the arc in a 121-108 win over the Bucks on Nov. 26, the Jazz were 8 of 23 on 3-pointers Saturday. Jazz: Utah continues its six-game trip at Chicago on Wednesday night. Bucks: At New Orleans on Wednesday night.